This chapter will present and discuss some successful experience of Shanghai’s e-government strategies and implementation from the perspective of a developing country. A case study of Social Security Card System (SSCS) in Shanghai will be conducted to further illustrate Shanghai’s e-government strategies and implementation experience. 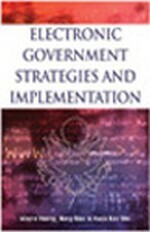 Differences of e-government implementation strategies between China and USA are identified and discussed, which may provide some useful insights to the other developing countries, especially to those developing countries that are under the process of transiting to the “market economy” model when implementing e-government in the near future.